An opposition politician of the National Super Alliance coalition reacts after a gas canister fired by police hits his car during a protest along a street in Nairobi. NAIROBI - Kenyan police shot dead two people and wounded a third when a crowd tried to storm a police station during an opposition protest against a looming presidential vote re-run, a senior official said. Around 20 youths attempted to take over the station during an otherwise peaceful rally in the town of Bondo in the southwest county of Siaya, forcing officers to open fire, County Commissioner Josephine Onunga said by phone. Police also used teargas to break up small demonstrations in Kenya’s three main cities - Kisumu, the capital and the port of Mombasa - defying a government ban on rallies in city centers. Kenya’s supreme court nullified the presidential election in August, citing procedural irregularities and voiding the victory of President Uhuru Kenyatta, opening the way to a repeat vote on Oct. 26. But opposition leader Raila Odinga has refused to take part, saying the re-run should not happen until wide-ranging reforms were brought in to prevent a repeated failure. The election board has said the polls will go ahead anyway, pitting Kenyatta against six other candidates, none of whom polled more than 1 percent in the August election. Odinga told Reuters that he might consider returning to the Supreme Court for clarification on whether the Oct. 26 poll was legal. “As far as we are concerned, that (original Supreme court) ruling is still valid,” Odinga said during a visit to London. He supported protesters’ right to demonstrate, he said, but he has so far stopped short of calling people onto the streets himself. Martin Kimani, the Director of the National Counter Terrorism Centre, said the opposition was trying to manufacture a crisis. 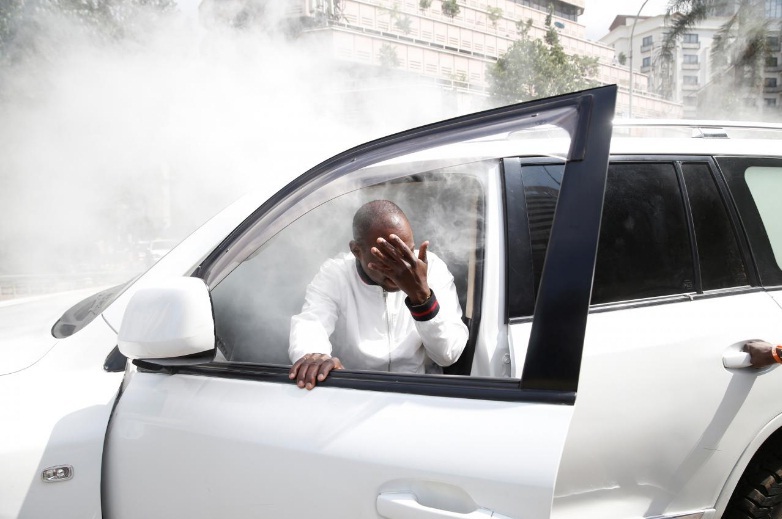 In Nairobi, opposition legislators were repeatedly teargassed as they tried to drive into the city center. “We are asking Uhuru’s government to ... let us protest in peace and truth and we are saying we want change and we do not want Uhuru and his people,” said protester Mellen Kirumbo. In Kisumu, a stronghold of Odinga support, protesters reacted angrily when police turned water cannon on them to prevent them from entering the city center. Kenyan police shot dead two people and wounded a third when a crowd tried to storm a police station during an opposition protest against a looming presidential vote re-run, a senior official said.